876494, A/Bombardier, D/282 Brigade, Royal Field Artillery. 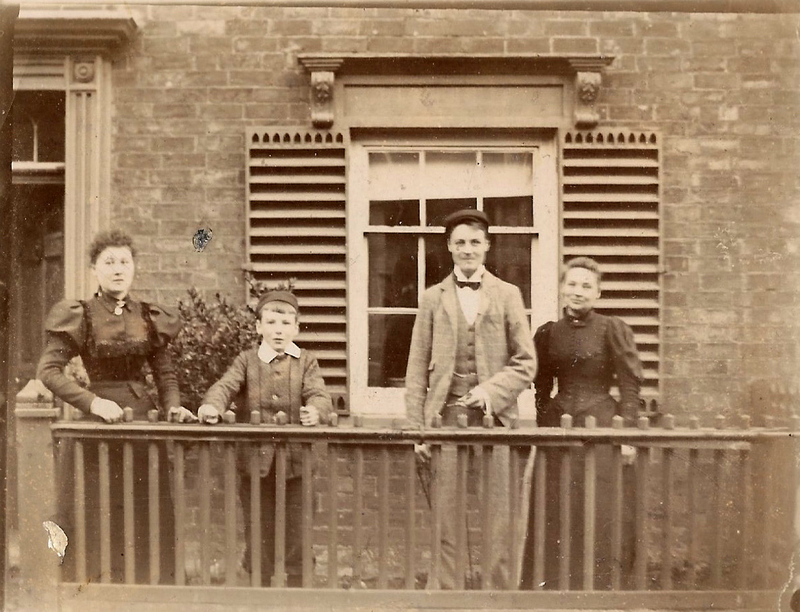 This picture was taken outside Joseph Hudson's home at 28 Queen Street, adjacent to the saddlery workshop (no longer standing) on Queen Street in Bottesford, c.1894. It shows the three Hudson children with their mother: from left to right, Herbert's sister Beatrice, Herbert Wright Hudson himself, his elder brother Frederick, and their mother Mary Hudson. From the Hudson family archive, courtesy of Mr Jonathan Hudson. 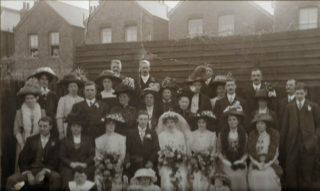 A picture from the wedding of Herbert Wright Hudson and Mabel Anne Piggott, 12th April 1912 at Norbiton, Surrey. To Herbert's left (as seen in the picture) are his sister Beatrice Goodson, mother Mary and brother Frederick. Frederick Hudson, also a teacher who returned to live in Bottesford in his old age, was capped playing cricket for Leicestershire. Taken in April/May 1916 in Kingston, at about the time Herbert Hudson transferred from the Leicestershire Militia to the Royal Artillery, this picture shows Mabel and Herbert with their sons Herbert and Frederick. The people in the picture are, from the left, Anne Mabel Hudson, Herbert Alexander Hudson, Herbert Wright Hudson, Frederick Dennis Hudson. 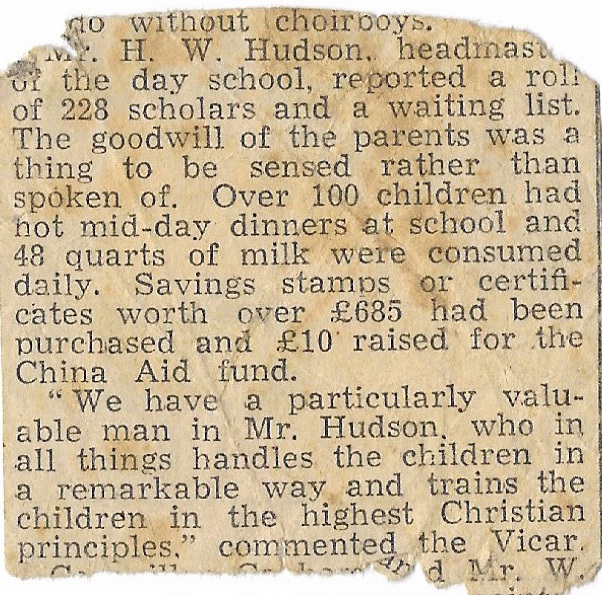 A newspaper cutting referring to Herbert Hudson's qualities as a greatly admired teacher. The date and newspaper are uncertain, but it probably dates from WW1 or later, when he was a teacher in Kingston-upon-Thames. 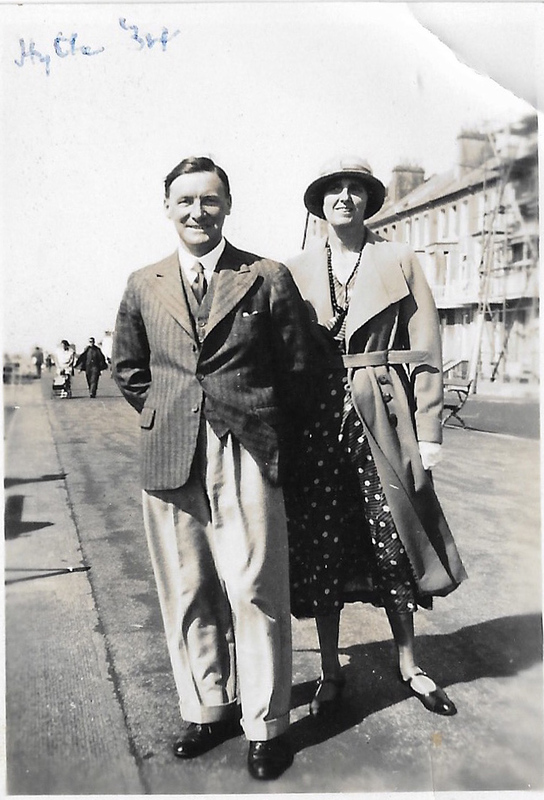 A holiday snapshot of Herbert Wright Hudson and Mabel Hudson on the promenade at Hythe, Kent, in 1934. Believed to be a picture of Joseph Hudson, the Bottesford Sadler, who died in 1917. Herbert Hudson is one of the men named on the Bottesford ‘church list’ of WW1 Servicemen. He was an Absent Voter in 1919, his home address being on Queen Street (at the house that has now become 2 maisonettes), his service details 876494 A/Bdr., D/282 Bde, RFA. His additional (earlier) service numbers were 2257 and 3332. 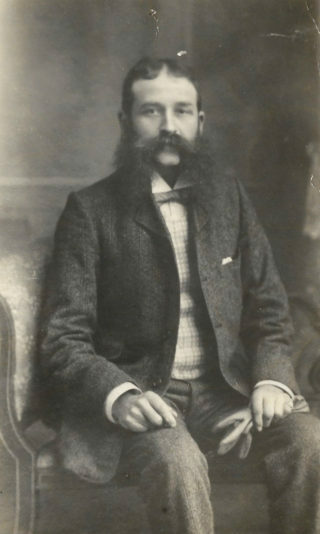 Herbert Wright Hudson was born on the 9th November 1884, and baptised on the 12th March, 1885, at Bottesford, son of Joseph William Hudson, who was born in the 4th quarter of 1852 in Bottesford, and Mary Ann Hudson (neé Wright), born in 1857 at Deeping St James, Lincolnshire. His parents married on the 21st February 1878 at St James, Deeping, and their first child John (called Joseph on his gravestone) Frederick was born at Deeping and baptised there on the 8th February, 1880. In 1881, saddler and harness maker Joseph Hudson and wife Mary lived on Queen Street with the first son John F. Hudson, b.1879. In the 1891 census, they were still on Queen Street, and there were now three children, Frederick (12), Beatrice (10) and Herbert (6). The house, known as “Daddy Hudson’s”, is now No.28 Queen Street. It was a saddler’s workshop, and hooks for hanging horse harnesses still exist. They were still there in 1901, and again in 1911, when 58 year old Joseph described himself as a “saddler and cow cottager”. Joseph Hudson died in 1917, aged 65, and was buried at Bottesford on the 26th March of that year. Both Joseph and Mary’s sons became teachers. By 1901, Herbert had become a Pupil Teacher at Bottesford School and his elder brother, John Frederick, had progressed to be a student in Teacher Training College. Herbert was first in year at Grantham Pupil Teacher Classes in 1905, as noted in the Bottesford School logbook by headmaster Victor Collett. Later that year, the Grantham Journal of the 29th June, 1905, wrote: “The London University Matriculation examination list, published this week, contains the name of Mr Herbert Hudson among the successful candidates. Mr Hudson, who is a student at St John’s College, Battersea, is the sixth “old boy” of Bottesford National School to pass this examination in the last five years.” On the 14th April, 1906, the Journal added that “Mr Herbert Hudson has been appointed an assistant-master under the Leicester Borough Education Authority, and will take up his duties after the summer holiday.” According to a grand-daughter of Maxine Kaye, he taught Bob Sutton, born in 1900, when he was a boy. Fred Hudson was married in 1907, as reported by the Grantham Journal, 17th August, at St Luke’s, Kingston-upon-Thames. His bride was Hattie Langrish, of Richmond. Fred was described as being captain of Kingston F.C., a prominent member of the Kingston Cricket Eleven, and secretary of the Teachers’ Choral Society. Herbert Hudson acted as best man. In 1908, when he was 23, Herbert gained four Distinctions in Teacher’s Certificate exams at Balliol College, and by 1911 had gained a position as an Elementary Schoolteacher, boarding with his brother Frederick, Hattie and their two children Nancy (2) and Bernard (8 months), at Highfield, Gloucester Road, Kingston, Surrey. Herbert was married in April 1912, again reported by the Grantham Journal. The ceremony took place on April 6th at St Peter’s, Norbiton, Surrey. His bride’s name was reported as Mabel Mary, elder daughter of Mr and Mrs H. Piggott, of Kingston-upon-Thames. She was, in fact, Annie Mabel Mary Piggott, born in 1888 in Richmond. They had two children, Frederick (22nd March, 1913) and Herbert (22nd July, 1914). 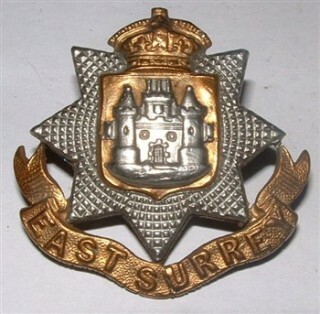 Herbert W Hudson entered service as Private 2557, 6th Battalion, East Surrey Regiment, on the 4th November 1914. He attested on this date at Surbiton, declaring that he was a school master, married, and had previously served in the 2nd Leicestershire County Militia. His home address was “Ridway”, Gloucester Rd., Kingston on Thames. On the 29th April 1916, he was transferred to No.61 Protection Company, Royal Defence Corps, then on the 22nd May 1916 to the 3/3rd Home Counties Brigade, Royal Field Artillery. He was with the RFA for the remainder of his service career. He was promoted Gunner, 30th September, 1916. He was transferred to the 3/1st East Anglian Brigade RFA on the 14th October 1916, with a new service number 3332, and disembarked at Le Havre on the 22nd October 1916, posted to the 56th Battery on the 30th October. After this he was moved again, to D/282nd Brigade RFA and appointed acting Bombardier on the 2nd August 1917, receiving full promotion to Bombardier on the 17th June 1918. He was put forward for a Commission with the artillery on the 31st August 1918, but it seems this was not successful. He was awarded the Military Medal in September, 1918. Joseph Hudson died on the 22nd March, 1917, of heart failure while in his workshop. The Grantham Journal reported that mourners at the funeral included Fred Hudson, but Herbert was unable to attend because he was in France serving as a gunner. Joseph Hudson was buried in Bottesford churchyard. On the 19th October 1918 the Grantham Journal reported that Herbert had recently completed two years of continuous campaigning in France. 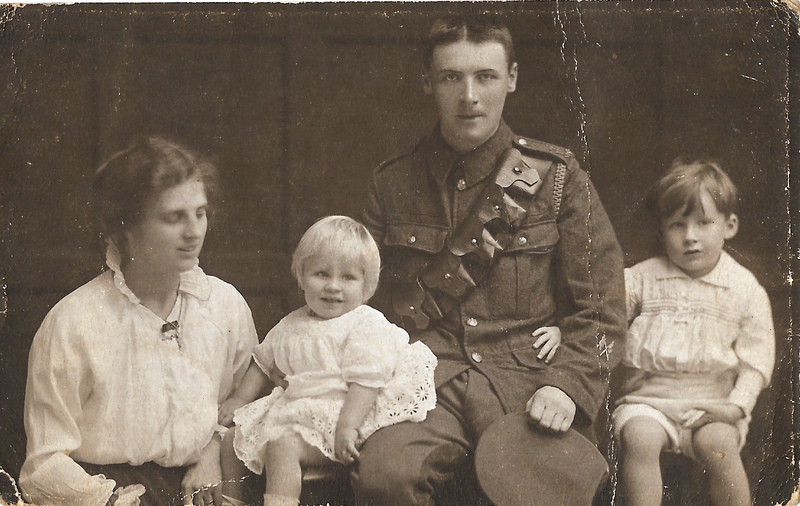 By the 17th January 1919, his service number had been changed to 876494 and he was recorded as an Acting Corporal, 211 Artillery Battery, RFA, and his home address as “Ellesmere”, Chesfield Rd., Kingston on Thames, where his wife lived. He was demobilized on the 13th February, 1919. It appears he then became part of the Territorials, from the 31st March 1920. His address was given as 33 Gibbon Road, Kingston, in a letter he wrote requesting a copy of his Discharge Certificate, which had apparently been lost. The letter was stamped as received by the War Office on the 18th October, 1926, indicating that he lived in Kingston at that time. He received the Military Medal for gallantry while serving in France. He was presented with the ribbon of the Military Medal in Brighton, as well as receiving letters of congratulations from his Colonel and from the General Officer commanding the Royal Artillery. He was also awarded the Victory Medal and the British Medal. An entry in the school log book reads: “The Military Medal for gallant service in France has been conferred in two former scholars:- Gunners Robert Mellors RFA and Corporal Herbert Hudson RFA. This makes the sixth old scholar decorated for gallantry” [Lest We Forget, p.214]. In 1920, Herbert Wright Hudson was entered by Teacher’s Registration Council, first position 1906, current residence at Kingston-on-Thames. He was also recorded on the National Union of Teachers Service & Casualties records in 1920. The 1926 date of the letter he sent regarding his Discharge Certificate seems to indicate that Herbert and his family lived in Kingston on Thames during the 1920s, but at some point the move was made back to Bottesford. The 1939 Register records Herbert W Hudson, born 9th November, 1884, Headmaster Elementary School, living on Queen Street, Bottesford. Although he is recorded as married, the other occupant was Mary Hudson, probably his widowed mother. Mary Ann Hudson died five years later, in 1944, aged 87, and was buried on the 7th February at Bottesford next to her husband Joseph. On the 15th December, 1939, the Grantham Journal reported on the inquest into the death of William Hudson, aged 68, an ironstone labourer who was knocked down by a car driven by a Sergeant Major Gordon Thomas Burrows, near his home at Redmile during the blackout. The mourners at his funeral included his daughters Mrs Sharp and Mrs Hewitt, Mr & Mrs C Hudson, and Mr and Mrs Herbert Hudson. The article says that Herbert was the deceased’s brother, but this must be a reporting error. However, the story confirms that Herbert and his wife were living in Bottesford in December, 1939. No further records or press references have been found regarding Herbert Hudson in Bottesford after 1939. It seems likely that Herbert and Anne Hudson left Bottesford, possibly after Herbert’s mother died in 1944, and moved to Wiltshire. Herbert Wright Hudson died at Trowbridge, Wiltshire, in 1980, aged 95. No other death records for a man of this name born in 1884 were found, so this was probably the retired teacher from Bottesford. His wife, Anne Hudson, died at Salisbury in 1976, aged 88. Footnote 1: Such records as have been found relating to Herbert Hudson’s life after his WW1 service are very few and far between, leaving a good deal of uncertainty. It is clear from the above that he was in Bottesford in 1939 and may well have stayed until 1944 or so. But the record is greatly complicated by the fact that Fred Hudson also came back to the village and remained there until he died in 1966. The first hand memories people have are almost certainly of Fred rather than Herbert. Many Bottesford residents remember Mr Hudson, the retired school master who lived in the village during the years after WW2. There are photographs of this gentleman, including one taken at the opening of Bottesford Bowls Club, c.1946, in which the caption states clearly that this was Fred Hudson, Herbert’s older brother. Fred Hudson’s first wife, Hattie, died in 1916 in Epsom, aged 28. He married a second time in 1921. On the 25th June, 1921, the Grantham Journal reported the wedding of Fred Hudson, head master of Willingham School and Pupil Teacher’s Centre, to Ethel Oldfield of Sturton-by-Stow. His brother Herbert Hudson was best man. Bride and Bridegroom left by motor car for Skegness. This was Fred’s second marriage. Willingham and Sturton are villages in northern Lincolnshire, near Gainsborough. Fred Hudson died 7th October 1966 aged 67, and was buried in Bottesford churchyard next to his parents Joseph and Mary. 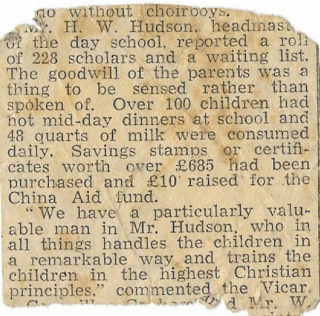 Mr John Goodson, grandson of Beatrice Goodson neé Hudson (sister of Fred and Herbert), recalls having private school lessons with Fred Hudson at his house on Chapel Street, Bottesford, next to the former Wesleyan Chapel. Mr Peter Topps also recalls Mr Hudson as a much liked Sunday School teacher who would stand when the regular teachers, spinster ladies Louise and Beatrice James, were not available. Mr Michael Bradshaw, Adelaide, wrote on 25/2/2013 to say, “Maxine Kaye said that there was a very old car discovered in the garage when Mr Hudson died. I remember that car which belonged to Mr Hudson, it was a Singer and I nearly bought it from him around the late 1950s or early 1960s. That was the model Singer when you started it the starter motor made a noise like a ringing bell. Also Mr Hudson … taught at Bottesford C of E, just before and after the war, he also helped out during my time at Bottesford School, around the late 1950s. He helped to teach English and it was my first experience of Rudyard Kipling, which has stayed with me all my life and his gift of imparting knowledge I have never forgotten”. 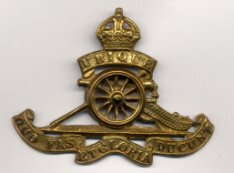 Footnote 2: A Gunner named H.W.Hudson was killed in action in the Western Desert, 60th Field Regiment RA, on the 21st November, 1941. However, this was not one of Herbert’s sons, all three of whom survived their service in WW2 (our thanks to Jon Hudson for this information). Herbert Hudson spent the first part of the war with the East Surreys, but joined the RFA in 1916 and only then saw action outside the UK in France. Herbert Wright Hudson is fondly remembered by his three Granddaughters and Grandson. He received the Military Medal for repairing a communications line under fire and recovering a wounded colleague. He told his Grandchildren how he sheltered from enemy gunfire by the coal heaps near Bethune and blamed the gunfire for his deafness in old age. However it is not as a soldier that he would want to be remembered but as a teacher and for the thousands of children he taught. He and Mabel (Annie) had three children as recorded above: Frederick, known as Dennis, Herbert Alexander, known as Bert or Alec and born in Kingston on 17:08:1919; Kenneth Harry, known as Ken. Herbert and Mabel lived in Kingston Upon Thames after the war and raised their three boys there. He was a keen photographer and there are photos of the family on holiday in the 1920s. He was greatly upset by the death of his older sister, Beatrice, who married into the Goodson family. Herbert remained in correspondence with members of the Goodson family until the mid 1970s. Herbert’s three sons joined up in 1939, Army, Navy and Air Force, and all survived the Second World War. Herbert remained in Kingston Upon Thames until the late 1950s but often used to visit his family in Bottesford. He was a keen student of Church Architecture and his photos, notes and postcards of churches exist to this day. He was a keen gardener and in retirement in Salisbury at 7, Broadlands Close was often to be found on the vegetable plot. In his 8th decade he used to quote Shakespeare’s “ages of man” speech to his grandchildren and remind them as ‘O’ levels approached that they ‘must have Maths’. He moved to a nursing home near Broughton Gifford near Trowbridge shortly before he died of cancer. I have custody of Herbert’s service medals. Herbert has a number of Great Grandchildren, the youngest Caroline has just completed her International Baccalaureate in Brasilia. His Great Grandson, Alexander, is a second year student at Hull University. Thanks very much for providing all this information. It is very often hard for us to find much about servicemen’s lives after the end of the war, so your memories are highly valued. Am I correct in thinking that he was your grandfather? Also, can I ask if you have any photos of Herbert that we could reproduce in this account? One of him as a serviceman would be ideal, but a later picture would also be gratefully received. Yes Herbert was my Grandfather. I have pictures going back to the 1890s when Herbert was a boy in Bottesford, also a wedding photo from 1912 that must include a number of Bottesford relatives. Which part of the website should I upload to.? Unfortunately some photos are in storage in the U.K. and I will not be able to retrieve them until I return from South America to retire in a couple of years.